Wow, that is amazing work! What a beauty. Wow, he's such a pretty birdy! I just want to reach right out and pet his little beak, great work! His texture is amazing. The anatomy is slightly off, but that doesn't bother me because it's too beautiful! Love love love this one, like Lisa I want to reach out and touch it's little feathers! wow this is lovely. I love how her stitches really give the feel of feathers. wonderful! perfect. i love the dark linen background too. Lovely little bird sitting on a branch...what a great and neat presentation?I would love to own one in my bag or even on my cushion!! !What are you doing with it? SO great!!! and inspiring :) I haven't stitched a thing in quite some time! 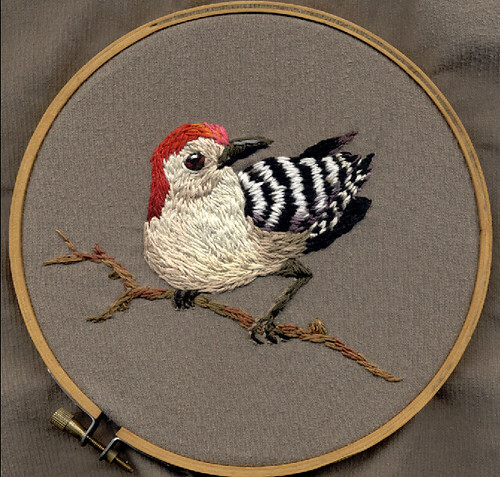 It's not often that a graphic of a woodpecker shows personality, let alone embroidery! Nicely done! oh my word! He looks like he could just fly right off the fabric. So beautiful! i love this! i can't believe you made this! did it take all year to finish, because it looks like it!